Like Trinkets-n-Treasures on Facebook to see all the up to date news. Also check us out on Etsy and Pinterest. 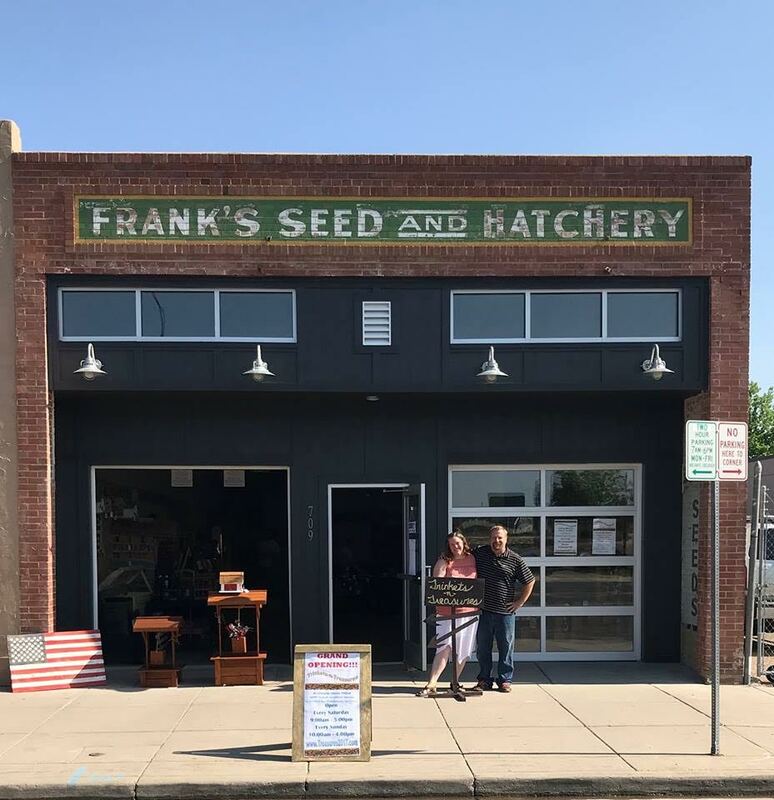 NOTE: The name, "Frank's Seed & Hatchery" is part of what has been declared as "historic" related to this building, and so cannot, nor will not be removed. Our business name is "Trinkets-n-Treasures." We Opened Our Doors Officially On June 9, 2018! We will now be open every day throughout throughout the year, except Mondays. Our regular hours on Saturdays will be from 9:00am thru 5:00pm. We'll be open on Sundays from 10:00am thru 5:00pm. We'll also be open for a short period of time every week day as well. Tuesdays thru Fridays, we'll be open from 4:00pm thru 7:00pm, so swing by right after work and check us out. We'll always observe shopping patterns and consistencies, as we consider adjusting our opening and closing hours on specific days of the week. We are also very interested in opening up our store whenever the city of Greeley has anything significant going on in our area of downtown Greeley. Please check back later for any adjustments we make. NEW CRAFT VENDORS ALWAYS WANTED! Are their products unique enough, as compared with our existing vendors, to provide more variety for our shoppers? Can they explain and/or demonstrate an ability to promote/advertise for themselves, to bring shoppers to their booth? Free method suggested include, but are not limited to: Craig's List, Facebook, Nextdoor.com, etc. Are their prices reasonable for the area our physical store is located in? Do they have the ability to get moved in by the weekend that our vacating vendor leaves? We want ALL of our vendors to be very successful, and strongly believe that if they fit the top 3 criteria above very well, then their chances of success dramatically increase for ALL of us! Though we currently have a waiting list, don't hesitate to consider requesting to be added to it. If you fit the listed criteria above better than any other vendor currently on our waiting list, then we will move you up the list, immediately. You can print the most recent Consignment Contract directly from our "Become A Vendor" page. Check out the "Our Vendors" page thru the link above, and know that YOU can be added there as well, once you've joined us as a vendor. Being added to that page is completely FREE! You just need to be a paid consignment seller. We have also started adding merchandise from our paid vendors to our online Etsy store as well. Those of you who have family members from the animal kingdom can bring those furry and fuzzy little (or big) buddies into our store with you. Not many shopping venues will allow this, but we don't believe our original 1927 wood floors will mind a few paws walking around every now and then. In fact, we also always try to have a full bowl of fresh water out in front for our neighbors who walk their dogs by our store. If you're one of those neighbors, feel free to allow your 4-legged family members to indulge themselves. We will refill those bowls as often as we need to. NOTE: In fact, one of our current vendors creates custom made preservatives-free frozen dog treats, too. Your canine buddy(s) will probably enjoy one or more of these tasty little tidbits for just $6.00 per bag. Welcome to our "Trinkets-n-Treasures" web site! This site is designed to provide information to both craft show vendors and shoppers alike! We have established a business that we hope will be a strong co-op between us our our vendors. We will never lose sight of the fact that our store is full of several smaller businesses, all in one brick-and-mortar location. We see all of our vendors and ourselves as one big team. When our vendors do well, we do well, and we'll strive to never lose sight of that philosophy. Check out our regular consignment vendors thru the page link above. If they are highlighted on that page, they are still selling with us. Note that our daily vendors will not be shown here on this site, since they will change out too frequently. We invite you to swing by and shop with us, though, and see who our daily vendors are that day, too. We'll also do everything we can to give back to our local community as well. One way we'll try doing that is by working with a specific group from the area, selecting at least one group per month. Those arrangements will see the groups helping to draw shopper attention to our store, while we donate cash to their programs based on the sales their support generates. Check out our Fundraiser page thru the link above, to find out more about how that program will work. If you lead or are a part of a group that might be interested in being a part of this cooperative effort, let us know thru our "Contact Us" page. Thanks again for stopping by! We hope you'll enjoy your stay and decide to come sell or shop with us soon! Feel free to contact us thru the links on the "Contact Us" page here on this site.